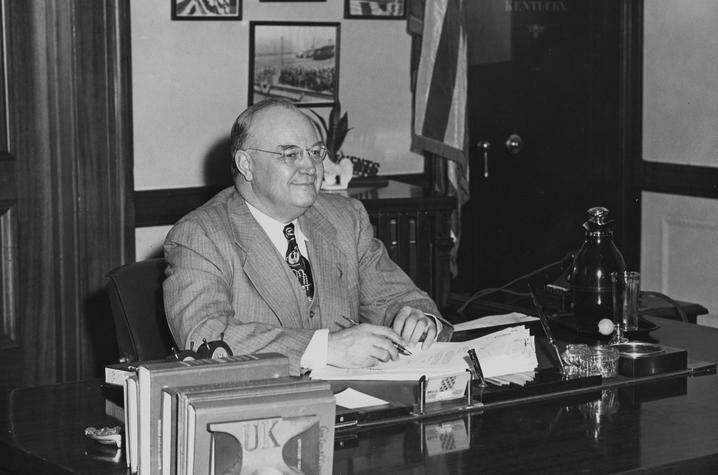 Earle C. Clements seated at his desk as governor of Kentucky. LEXINGTON, Ky. (April 9, 2019) — The National Archives and the University of Kentucky Libraries Wendell H. Ford Public Policy Research Center are now taking self-nominations for the Earle C. Clements Innovation in Education Award for Civics and History Teachers (Clements Award). The submission deadline is Friday, May 10. The Clements Award recognizes promising and innovative Kentucky high school educators and honors the life and career of the late Earle C. Clements and his lifelong commitment to education and public service. Clements’ political career included service as a county sheriff, clerk and judge; in the state Senate and as governor; and in the U.S. House of Representatives and U.S. Senate, where he was a close colleague of future President Lyndon Baines Johnson. evidence of creativity and innovation. a letter of support from principal. In addition, applicants have the option to also submit a sample assignment and/or other supporting materials, including student letters of support. University of Kentucky, Lexington, KY 40506-0039. Winners of the Clements Award will be notified in May and the award ceremony will be held in summer. For more information on the Clements Awards or to send questions, email Deirdre Scaggs, associate dean of UK Libraries Special Collections Research Center, at deirdre@uky.edu (include Clements Award in the subject line). The National Archives is an independent federal agency that serves American democracy by safeguarding and preserving the records of our government, so people can discover, use and learn from this documentary heritage. The National Archives ensures continuing access to the essential documentation of the rights of American citizens and the actions of their government. From the Declaration of Independence to accounts of ordinary Americans, the holdings of the National Archives directly touch the lives of millions of people. The agency supports democracy, promotes civic education and facilitates historical understanding of our national experience. The National Archives carries out its mission through a nationwide network of archives, records centers and Presidential Libraries, and on the Internet at www.archives.gov.